Pre-drawn data flow model symbols represent external entity, process w/location, data store, interface, jump, etc. These symbols help create accurate diagrams and documentation. Edraw software provides you many data flow model diagrams, external entity, process w/location, data store, interface, jump, angled connector, top to bottom, bottom to side, side to side, side to same side, top to top side. Data flow diagram shows the movement of the data. 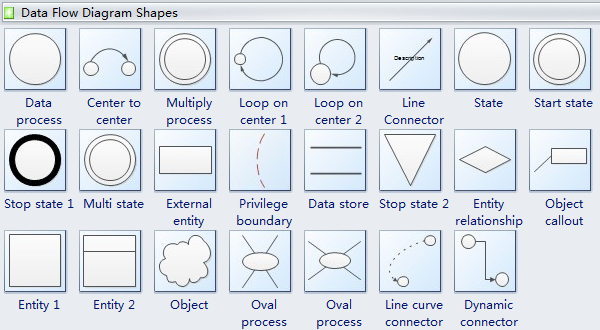 The shapes like data process, center to center, multiply process, loop on center, data store, line curve connector and more data flow diagram shapes are included here. Data process symbol is represented by a circle because circles represents data in most flowcharts. External entity is used to show sources and recipients of data from the business system under investigation. External entity symbol represents sources of data to the system or destinations of data from the system. They can represent: people, organizations, other business systems and computer systems. 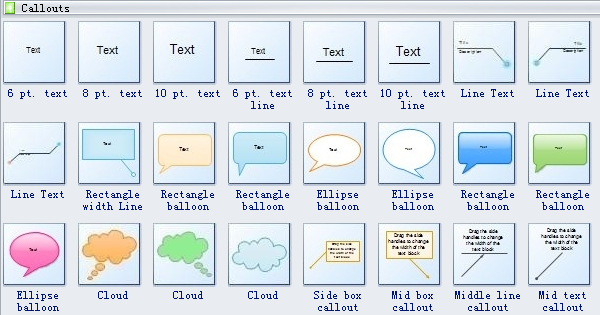 Interface is a device or program enabling a user to communicate with a computer. Data store is a data repository of a set of integrated objects. Data store includes not only data repositories like databases, it is a more general concept that includes also flat files that can store data. Data store symbol represents data that is not moving (delayed data at rest). Multi state symbols, as its names shows, can represent several states. As the above picture shows, you may clicking the floating button to choose one specific state. 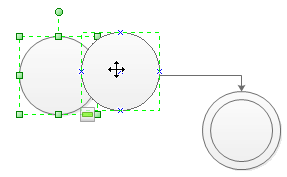 Moreover, whem two data flow symbols are connected via dynamic connector, when you move one of the two symbols, the dynamic connector will move with it automatically. Need fresh looking data flow model symbols for your design? These data flow model symbols are a cinch to pop in. And their crisp, fine detail will make spectacular, easy-to-understand diagrams and presentations to your customers.